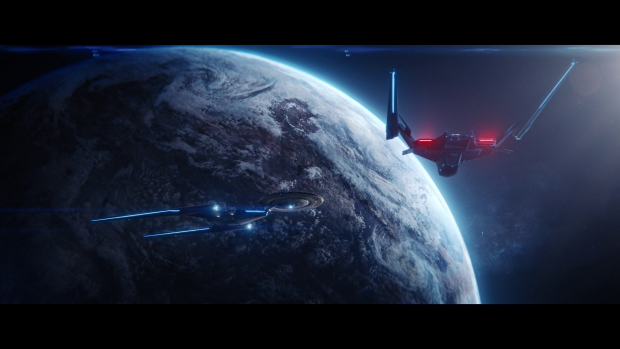 Star Trek: Discovery reveals the identity of the Red Angel and tackles various emotionally driven plots that are both linked and entirely separate. The previous episode did a really good job quickly developing a background character so that her death would be meaningful when it happened at the end of the episode. This episode begins with Airiam’s funeral to show the impact her death has on the crew. Star Trek in general has often toyed with the idea of a Starfleet crew being a family created by circumstance and Airiam’s funeral delivers the Discovery version of that through the heartwarming eulogies delivered by key characters during the service. It is somewhat emotionally manipulative and serves as a reminder of how little development Airiam was actually given but it sets up the theme of family that defines this episode nicely. Once the funeral is out of the way the characters get back to the problems at hand namely the threat posed by the Control A.I. that is likely far from over and the small issue of the end of sentient life in the galaxy. 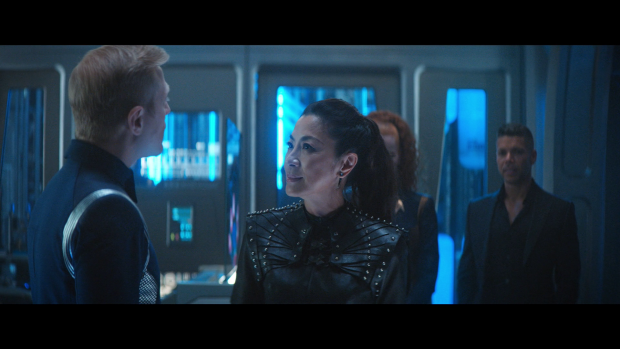 At this point there isn’t enough to go on until Tilly barges in and reveals that the information within Airiam’s memory points towards Burnham being the Red Angel. Readers of this site will know that this has been my prevailing theory for a while now so this fairly understated reveal instantly made me suspect that there was something else going on. Surprisingly the characters all proceed as if this is an inarguable fact and work on a way to bait the Red Angel into a trap by risking Burnham’s life to trigger an appearance to save her life. It isn’t a bad plan as such because if the Red Angel is Burnham then there’s no way she would allow herself to die at an earlier point in her personal timeline as that would risk her fading from existence. The most baffling thing about this is that nobody doubts the information at all which isn’t very scientific as there should be at least some room for doubt especially if being wrong means Burnham’s death. This episode mostly consists of build-up to the eventual reveal of the Red Angel’s identity by focusing on how the characters react to the knowledge they think they have. Spock immediately gets behind the idea of the Red Angel being a future version of Burnham because it fits with his perception of her. He talks about Burnham’s tendency to make herself responsible for things that have nothing to do with her and suggests that her flair for the dramatic might be enough motivation to don a cybernetic suit and set out on a quest to save the galaxy. It’s an amusing exchange that takes advantage of the brother/sister dynamic and makes for a recognisably traditional Spock moment from Ethan Peck. His version definitely has his own stamp on the character but the episode makes him feel more like Spock. Spock and Burnham reconcile to some degree in this episode. Burnham admits that she always finds a way to blame herself and apologises for the effect her guilt had on his family when she was a child. Spock points out that she was a child and was unable to fully comprehend the situation but accepts her apology for the benefit of Burnham’s emotional closure. It’s a touching moment that brings them closer together and allows some common ground to exist between them. The Spock/Burnham dynamic is complex and wonderfully portrayed which allows for strong scenes like this. Burnham learns an uncomfortable fact about her own past through Leland’s confession about what really happened to her parents. Apparently they were tasked with working on Section 31’s time travel research and were stationed in a location where they were best placed to study it. Unfortunately for them the Klingons were also researching the same thing and ended up killing them because of what they knew. This is Leland’s fault because he was the one who got them the stolen time crystal and led the Klingons right to them because he was young and careless with far too much to prove. To Leland’s credit he seems genuinely remorseful for what he’s done and it’s a secret that clearly weighs on him but Burnham is in no position to look at this objectively and finds all the emotion associated with learning the truth overwhelms her. She rightly strikes Leland twice -once for each parent- and struggles to process this from then on. This scene backed up my suspicions that there was something else going on as it clearly foreshadows the reveal that the Red Angel would turn out to be one or both of Burnham’s parents. With them being the inventors of the time travel tech there are many possibilities that allow them to escape death and it still matches the evidence pointing to Burnham established earlier in the episode as well as the circumstances around the appearances of the Angel to her and Spock. That’s not to say the reveal that the occupant of the suit is Burnham’s mother -played by Sonja Sohn- doesn’t work because it does. The reveal is handled in such a way that the viewer’s perspective matches Burnham so the emotional impact of the person she sees in front of her is felt. As I’ve mentioned repeatedly this show revolves around Burnham so having her mother unexpectedly turn up alive and well sporting very advanced technology fits that perfectly as it lays down the gauntlet of emotional character driven storytelling around how Burnham will deal with this. This helps ground the fantastical elements and the ridiculous stakes associated with the end of sentient life in the galaxy with something far more compelling and relatable. The reveal that Section 31 were working on the time travel tech decades ago as part of a temporal arms race with the Klingons who were working on the same thing makes little sense when any plot is applied to it. There have been many rudimentary images of the Red Angel before this point that provide a good enough look at it to at least consider the possibility of it wearing the tech that was being worked on all those years ago. I can accept that Section 31 wouldn’t share that with Pike or anyone else on Discovery but it could have been the subject of a clandestine conversation between Leland and Georgiou for example. From the audience point of view they go from being fascinated by this mystery to having detailed schematics of their identical looking prototype and it feels like something significant is missing. This is more of a narrative convenience as to reveal this earlier would have given too much away and robbed the reveal of much of its power but it doesn’t help that none of this makes sense from a character and narrative standpoint. Georgiou continues to be a delight in all of her appearances. There continues to be a lot of depth to this character as shown by her distaste of debate as a method of problem solving, her clear compassion for Burnham and the discomfort she takes great joy in creating in the midst of the Stamets/Culber situation. The latter is a lot of fun to watch and is perfectly punctuated by Tilly questioning what exactly happened. It’s well established that Georgiou cared deeply for her Burnham and this extends to the version she deals with. She also has a strong code of honour as evidenced by her not simply telling Burnham what happened to her parents because the secret wasn’t hers to reveal so she does what she can to lead Burnham to the position whereby she can find out for herself. It’s nicely devious and shows that she is capable of compassion. Spock’s suggestion that Culber pushed Stamets away because he’s uncertain about himself is picked up here through a discussion between Cornwell and Culber. He goes to her because of her background in therapy and has an open conversation with her about how isolated he currently feels. She points out to him that he’s completely new and he agrees as his feelings for Stamets feel like they belonged to someone else, as if he has the memories of a stranger. At this point he is full of uncertainty about what to do next but knows he doesn’t want to hurt Stamets but isn’t sure what to do with it. Cornwell doesn’t give him any answers because it isn’t her place to do so but she does offer advice that might help him focus his thinking. Culber’s return is a fascinating prospect as it throws up a lot of interesting questions about identity and what defines that for a person. Is someone simply a culmination of their experiences or is there something deeper going on? For Culber does this mean he can focus his energies down a different path not connected to the life he lived before or does he simply need to rediscovery his place in the universe. At this point it could go either way. A strong episode that plays nicely with audience expectations a to the identity of the Red Angel and delivers excellent characterisation. The early reveal that a future version of Burnham is the Red Angel is an effective red herring that leads to an emotionally driven reveal that still fits with the established facts. Burnham learning that Leland had a hand in the death of her parents is as impactful as it needs to be and plays out in a really nuanced way with Leland showing genuine remorse. Burnham and Spock’s reconciliation is also really well handled as it depicts Burnham understanding where Spock is coming from which allows them to find common ground. 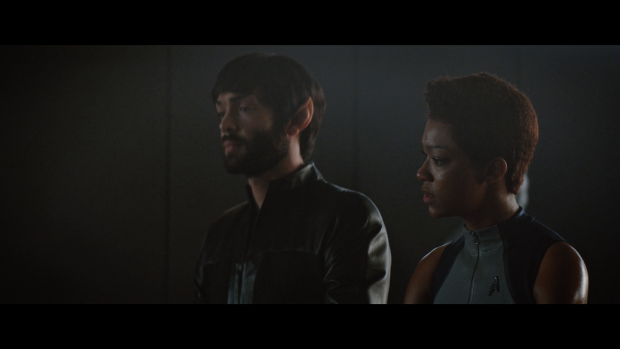 In general Ethan Peck’s performance has some familiarity to it making him feel a bit more like a traditional Spock. Georgiou continues to be a delight and a wonderfully complex character with different examples of her multitude of facets such as disliking debate driven problem solving, honourably pointing Burnham towards learning the truth about her parents and having fun with the inherent discomfort of a situation. Culber’s conversation with Cornwell is an excellent exploration of how he feels at this point. The memories he has feel as if they belong to someone else and he lacks direction in his own life at this point. Cornwell doesn’t advise him to do anything specific as she recognises he has to decide that for himself but she does help him realise he has to find his own path. Culber’s arc is raising a lot of difficult questions about identity and what it is that defines a person. At this point it’s unclear what Culber will do but the journey is an interesting one. 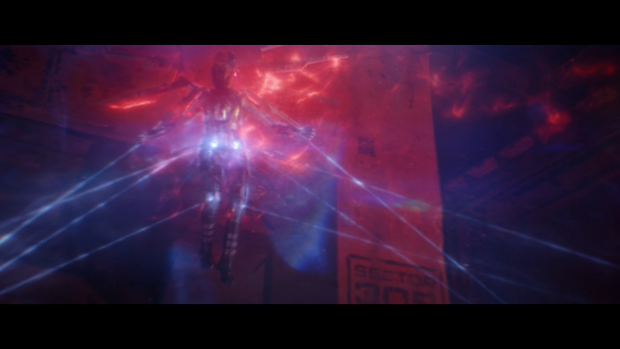 The reveal that Section 31 were working on a time travel suit that looks exactly like the Red Angel doesn’t work if you apply any thought to it as there is no point over the past few episodes where anyone at Section 31 suggests that the images of the Red Angel remind them of something. Similarly the characters don’t ever consider the possibility that they have the wrong information.